Anchor Brewing has extended its partnership with the California State Parks Foundation, and we hope you’ll join us in our efforts to preserve and protect state parks. 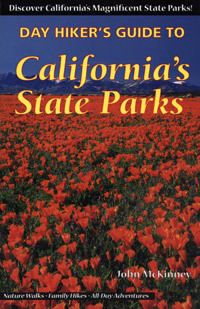 Through September, Anchor fans can become CPSF members at a special rate (just $20), and get a FREE CA State Parks hikers’ guide. Sign up by visiting calparks.org/anchor. Anchor employees have joined CSPF staff for volunteer days at Fort Ross, Half Moon Bay, Candlestick Point and China Camp State Parks, with more to come. And we’ve committed a portion of the proceeds from sales of Anchor California Lager to support California State Parks. Anchor California Lager was inspired by the first genuine lager made in California during the late 19th century, enjoyed by early settlers who were captured by the state’s stunning environment. We’re similarly taken by California’s diverse terrain and our partnership with CSPF has significantly furthered Anchor’s role in environmental stewardship. Together, we celebrate and protect California’s enduring natural heritage. Citizens for East Shore Parks is funding a study on land birds and habitat in the Albany Bulb. The Jack London Park Partners grant will help update and modernize The House of Happy Walls Museum, the park’s main visitor center and museum. The Santa Barbara County Trails Council will add an entrance sign, kiosk, trail markers, and maps for an underutilized area of El Capitán State Beach, making it more accessible for the public. Check the Anchor blog for details on these and other initiatives. In the meantime, please join Anchor Brewing in supporting the California State Parks Foundation by becoming a member today. The membership drive runs through September 30, 2016 at calparks.org/anchor. The sooner you join, the more time you’ll have to put your free hiking guide to good use this year!